In the spirit of Wilson A. 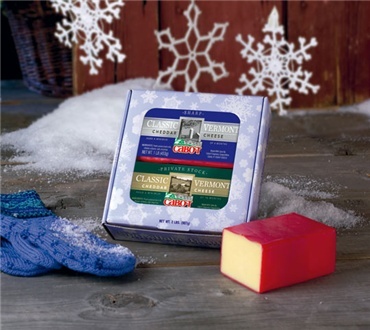 (Snowflake) Bentley, the first to photograph snowflakes and prove that no two are alike, Cabot offers two unique cheeses that embody perfection. Like this Vermont native's attention to detail, Cabot takes time to deliver taste to the most discriminating cheese connoisseurs. One pound each of hand-waxed Classic Sharp and Private Stock are presented in a gift box adorned with authentic Bentley snowflake photographs. A gift that will not be forgotten. We usually have some before dinner with crackers and good family company.